Julius Caesar at OSF. Left to right: Rodney Gardiner, Armando Durán, Danforth Comins. Photo courtesy Jenny Graham and the Oregon Shakespeare Festival. Check here to see our comprehensive coverage of the OSF 2017 season as it is posted. UniSon: UNIVERSES adapts the poetry of August Wilson to the stage. The performance troupe UNIVERSES, also responsible for 2012’s intriguing Party People, adapts to the stage the little-known poetry of August Wilson (Fences, The Piano Lesson.) This daring piece reinterprets the work of one of the greatest minds of African-American theatre by combining the classic language of the 20thCentury with the structure of the 21st. Hannah And The Dread Gazebo: A world premiere about family, identity, and the ghost of Kim Jong Il. This world premiere from playwright Jiehae Park grapples with questions of family and national identity in a tight 90-minute show. Much of the action concerns the tensions between North and South Korea and the DMZ in between them. Julius Caesar: Shakespeare’s legendary tragedy about leadership, violence, and betrayal. Shakespeare’s political thriller Julius Caesar occupies a position among his greatest tragic works, alongside such plays as Hamlet and King Lear. While OSF’s previous production, in 2011, was a general look at leaders whose deeds were both great and terrible, the 2017 version, as described in the “From The Director” statement on OSF’s website, more specifically examines the culture of American violence and politics. Armando Durán, who also played roles in Hamlet, King Lear, and The Tempest in his 18-year residency at OSF, takes on the part of Caesar. Henry IV, Part 1: A young Prince Hal is torn between duty to his country and his rollicking life with Falstaff. The first part of the Henry V trilogy features a youthful, irresponsible Prince Hal (Daniel José Molina) beginning to choose between the responsibilities of leading a country and the pleasures of tavern life with his friend John Falstaff. OSF is producing the entire trilogy over two seasons, performing Parts 1 and 2 of Henry IV this year and Henry V as part of the 2018 season. The Merry Wives of Windsor: A small town conspires to trick the mischievous Falstaff (yes, the same Falstaff). This classic comedy features the lecherous drunk Falstaff, a returning character from the Henry IV cycle. K.T. Vogt, who appeared in other OSF comedies like Animal Crackers and The Yeomen of the Guard, assumes the role in this production, which uses the play’s original setting of Elizabethan England – a place and time Shakespeare rarely used. This is the first time since 2006 that OSF has produced this play, though the company produced a modern adaptation called The Merry Wives of Windsor, Iowa in 2012. The Odyssey: Mary Zimmerman’s adaptation of Homer’s epic story of adventure. Director Mary Zimmerman (see my reviews for two other plays she directed, Guys and Dolls at OSF and Treasure Island at Berkeley Rep) brings one of the oldest adventure stories known to humankind to the Ashland stage. 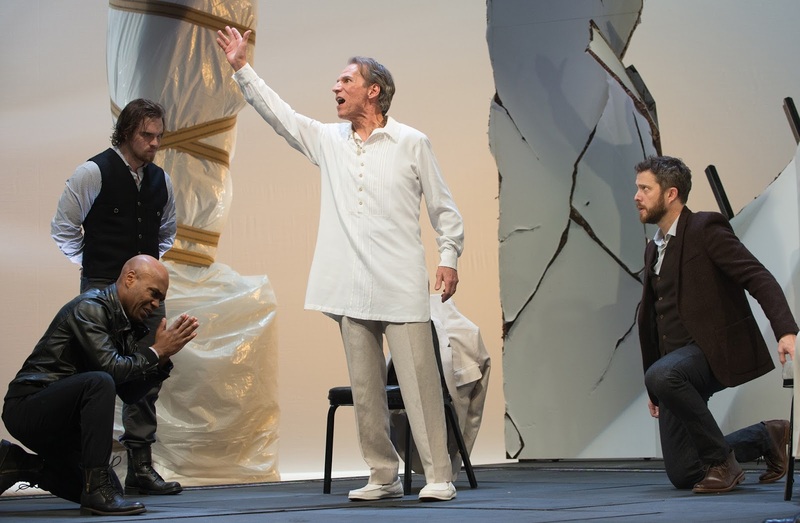 The Odyssey is set in the Elizabethan Theatre, which possesses significantly more vertical space than OSF’s other two venues; Zimmerman's movement-oriented direction should put this extra room to great use. Beauty And The Beast: The classic Disney musical, brought to the outdoor Elizabethan Theatre. OSF’s musical this year is a stage adaptation of Beauty and the Beast, an animated movie from Disney’s early-90s renaissance. Though the decision to run a Disney musical may raise some eyebrows, the show boasts a score from the legendary Alan Menken (Little Shop of Horrors). This music, combined with OSF’s ability to breathe new life even into Broadway’s most venerable standards, promises an exciting show.